How to get there: Located in Ballycotton village, East Cork. Suite: €60 per night supplement on room rate below. Dinner: Yes - Beautiful restaurant overlooking water. Swimming Pool: No - but use of pool in sister hotel - the Garryvoe nearby. Double Room: From €129 - Room Only Family From €129 Room Only. Suites from €189 Room Only. Ballycotton is a completely unspoiled Fishing Village in East Cork dating back to 1250 AD. Not only is it completely unspoiled but it is also largely undiscovered save by those in the know, for people tend to dash on further west to the more overblown high profile villages. Once you turn down at Castlemartyr you whirl around the back roads amongst high hedges and fertile fields which are eons away from the modern world - and yet so near. Ballycotton is an ideal base for visiting Cork, if you prefer to stay out of a City, or for taking a leisurely tour of Stephen Pearces Pottery and for visiting Ballymaloe, Cobh and the Jameson Irish Whiskey Centre at Midleton, after which you might need to be careful on the Ballycotton Cliff Walk! The Bayview Hotel in my eyes is just perfectly designed, for all the rooms have magnificent sea views. As you look out it feels more like a "visual tour" because you are just over the sheer drop onto the rocks, gazing out into infinity, broken only by the old world little quaint Ballycotton Harbour..... Food is fab think prawns the size of your thumb, silky foie gras, fillet of turbot with chargrilled fennel, saffron mash, olive oil and lemon dress… There are six golf courses within 30 minutes drive, as well as some of the best sea angling in Europe. Stephen Belton provides a 5 star service at the 4 Star Bayview. 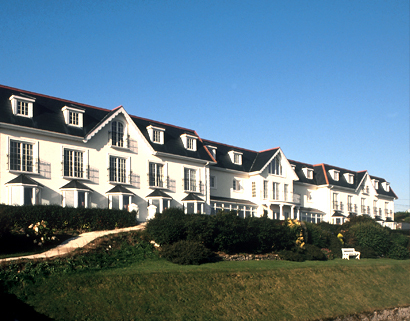 The Bayview Hotel is a place for cognoscenti Go and discover it for yourself.